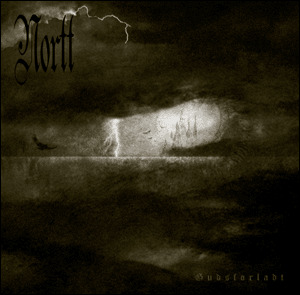 Denmark's ubiquitous Nortt is a reclusive vocalist and multi-instrumentalist specializing in what critics have labeled "depressive black funeral doom," and whose closest parallels include Australia's equally bleak and misanthropic diSEMBOWELMENT. 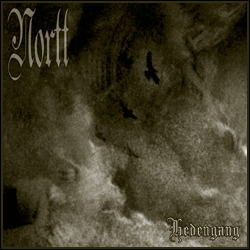 Beginning his experiments in 1995, Nortt has recorded a number of demos (97's "Nattetale," 98's "Doeden," 99's "Graven") and official releases, most of them short-form singles and EPs like 2002's Hedengang and 2003's Gudsforladt. That same year saw a compilation of his scattered works unleashed as Mournful Monuments 1998-2002, but that's about as big a picture as we're likely to see of this intentionally obscure artist. 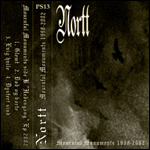 Nortt emerged from the deepest recess of darkness in the autumn of 1995. In alliance with the devil and a soul dedicated to death, a crusade towards eternal rest had begun. Two years passed by, creating what was to become an original concept founded on nihilistic philosophy and misanthropy welded with ghastly black metal and melancholic doom metal, which for ages had been a true possession of the sole creature behind this act. The elegies of Nortt tell about death and darkness viewed from the dying and from the dead. They reveal a bitter hate towards life and its divine maker. They praise the darkened soil as the godforsaken heaven – a heaven in hell. Thus, this has nothing to do with pity. In order to unchain oneself from the despair of life, follow the path of death! At a funereal pace and with a sombre, chanting voice, Nortt summons the forces in the night. Under the influence of those forces, “Nattetale” (Night’s Tale) was recorded in the darkest hours of October 1997. The thoughts behind this first chapter were to let the night come alive and thereby bring forth the alluring tale of solitude in eternal darkness. Another year passed before the second release, “Døden…” (The Death…), became an unholy reality. It was another mournful creation with the intention of leading the listener towards the inevitable destination of life – the grave. When 1999 was drawing to its close, the third creation of misery was released; it was titled “Graven” (The Grave). A sad tale told by lost souls caught in a miserable void. With the painful cries from these un-dead souls, a trilogy of demo releases ended the first era. Then in late spring of 2002, Italian Maggot Records released “Graven” as a 10” pic disc in a limited edition of only a hundred copies! However, the 10” does not contain the entire recording, despite what the track list reveals. A couple of months then passed until Sombre Records from the German underground released yet another recording on vinyl: a 7” EP entitled “Hedengang” (The Passing). An epitaph from beyond the grave. After a burial, the deceased is forgotten and has thus been blessed with unholy salvation. By the end of April 2003, Possession Productions hailing from Belarus released a cassette under the name of “Mournful Monuments 1998-2002”. As this title indicates, it consists entirely of elder material. When the fifth month anno 2003 dawned, “Gudsforladt” (Godforsaken) was unleashed as a 12” LP. Once again, Sombre Records brought life into this creation of unholy death. This record gathers the strongest material of the past along with new compositions. If there is any light left in your insignificant life, with any luck, this will blow it out! The Danish record label Diehard Bloodline released “Gudsforladt” on CD in February 2004. This exclusive edition appears in shape of a case-bound digi-book limited to a thousand hand numbered copies. An additional track, “Evig hvile”, is featured exclusively for the CD release. 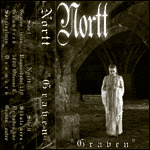 Furthermore, in February 2004, Swedish Total Holocaust Records raised Nortt to another level by releasing the third demo, “Graven”, as a full-length CD. At last, the visual aspect of “Graven” was also served justice with the release of a 12” LP through the Greek record label Cryptia Productions. 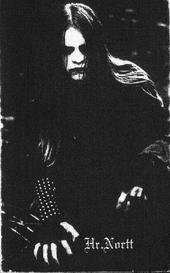 In the dead of December 2004, Total Holocaust Records then spawned a split CD with the suicidal black metal act Xasthur. The contribution from Nortt was the “Hedengang” EP. 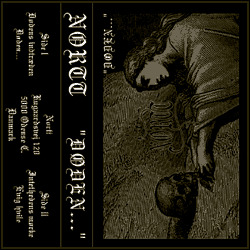 This split release was re-issued by Southern Lord Recordings in the spring of 2005. In addition to the re-issued CD version, the doomed North American label also released a 12” vinyl version of the album, showing different artwork. “Ligfærd” (Funeral March/Journey of the Dead) descended from the blackened sky at the end of 2005. Conjured forth in the dead of night, an intervention from the beyond increased the funereal atmosphere on this eerie full-length album, creating the strongest and darkest material thus far! 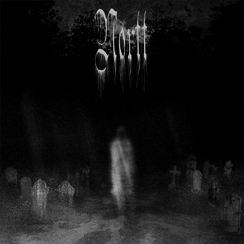 From the crypts of Possession Productions, Total Holocaust Records, Cryptia Productions and German Viva Hate Records, “Ligfærd” will haunt mortals everywhere! A covenant was entered with legendary Italian record label Avantgarde Music in March 2006. And thus, the dark crusade of pure depressive black funeral doom metal will continue to haunt your soul!